Chocolate is surprisingly big business – whether it’s a common chocolate bar bought at the grocery store or a highly-specialized gourmet version made from rare cocoa beans picked by hand. The average American eats approximately 12 pounds of chocolate per year, totaling about $18 billion annually. The FDA is considering a “citizens petition” from the Chocolate Manufacturers Association, which will allow chocolate manufacturers to use the name "chocolate" for products made with less-expensive vegetable oil instead of cocoa butter. Cybele May wrote an article for the Los Angeles Times against this change and she clarifies the reasons behind the petition and how the chocolate market and consumers would be affected. 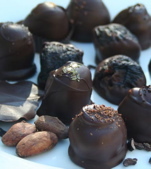 Chocolate purists take note: The FDA is allowing comments on the petition until May 25th. Cybele May is the author of a blog devoted to sweets and confections, called CandyBlog.net.